2K were in a call with their investors last night, so we picked up the other phone and tried not to breathe too loudly. What we heard made us shout “muuu-uuuum!” and slam down the receiver: Turtle Rock’s Evolve has been pushed back “a few months”, from the Autumn till February next year. 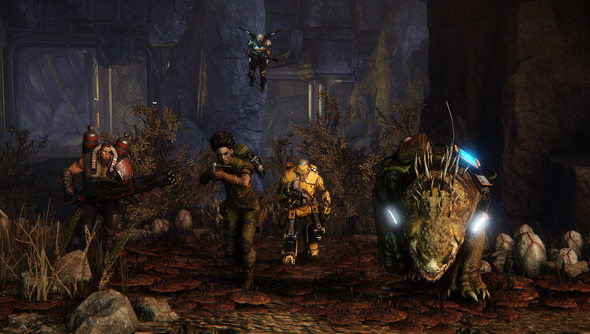 Evolve’s new release date is February 10, 2015. Take-Two king Strauss Zelnick told investors that Evolve deserves the extra months of polish to reach its “absolute optimal state”. “Historically, we’ve always benefitted from giving the creative teams more time to polish their titles,” he argued. “We’ve never regretted it. It’s worth noting that this isn’t a “meaningful” delay for 2K, because Evolve will still come out within its intended fiscal year. This is the sort of thing that’s important to you if you take calls from Strauss Zelnick. Once the earnings call was over, 2K released a statement to reaffirm their faith in Turtle Rock. Aces. Essentially, Turtle Rock’s monster is taking a few more minutes to sneak about the map and bulk up on creeps before it launches its offensive. That okay with you?